Gold frame with brooch-clasp attachment. 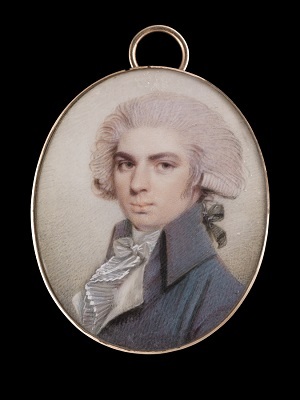 The present portrait miniature, dateable to the late eighteenth century, is a fine example of how the identity of highly accomplished painters can be lost over time despite their apparent capability. The artist was no doubt familiar with the style of painting in vogue at the time, and we see a very subtle combination of precise linear strokes in the jacket and fine delicate stippling in the face. There is also powerful characterisation in the face achieved through depth in the sitter’s right eye socket and a slightly raised upper lip on his left. His hair, which appears to have an almost pink tinge to it was a fashionable statement of the times, and John Smart frequently painted his sitters in this manner during that period.